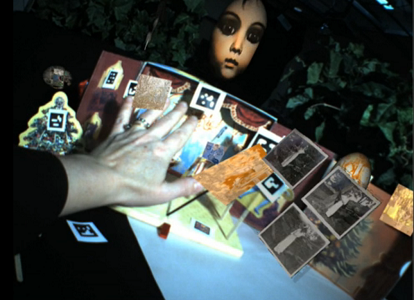 This augmented reality (AR) work tells the story of three generations of women through a series of short poetic videos organized spatially on a table top installation. In the version documented in the video, the work used a printed out marker system and a webcam connected to a computer to move from one marker to another. As the camera is able to identify the markers, the software replaces them with a short video with a voice recording of Fisher reading a poetic text. Beautifully produced, the videos visually engage the theme of memory by focusing on old photographs, photo albums and family heirlooms, and reinforcing this aurally through vignettes that breathe life into these objects. AR technologies are fascinating because they open up the world as a canvas for artistic creation, bringing the digital world into analog spaces. Markers like QR codes are easily detectable by computers equipped with a camera and the right software, and can be placed anywhere to produce locative works, or arranged spatially as Fisher has done with tabletop objects, Carpenter with maps, and Borsuk with the book. The main challenge for these kinds of works is that the computational infrastructure needed can be an obstacle for potential readers. The mechanics of looking at a screen with one’s eyes and a different surface through a camera or waiting for a video to load over a slow data connection can hinder what might otherwise be an immersive experience. Fortunately, multiple technologies are moving in directions that will facilitate this kind of experience, as is the case with portable devices with screens and cameras that can be used “as a magic looking glass to explore the story world” (to quote Fisher). As computers become so portable and miniaturized as to become wearable and ubiquitous, electronic literature will increasingly move out from its virtual spaces and write on the world. In the meantime, there is a glitch aesthetic to be explored in these early technologies, such as the visual and aural overlays we can witness in “Circle” as the camera catches multiple markers at a time. By arranging the markers so close together using swiveling sticks to reveal markers and having others on constant display, she has written both single and choral voices that sing across holographic split-screens.